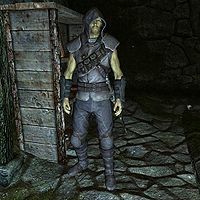 Linwe is an Altmer thief and the leader of the Summerset Shadows in Skyrim. He resides in Uttering Hills Cave, from where he conducts the business of the Shadows around Windhelm. He uses Niranye in Windhelm as the fence for the group, but rarely sees her personally. He wears a special set of armor that has similar properties to the Thieves Guild set of armor. It is made up of Linwe's armor, boots, gloves, and hood. His style of thievery differs from the Thieves Guild in that he prefers stealing from the recently deceased in the Halls of the Dead, but like the Guild he does not kill them himself. He is not averse to robbing the graves of the more long-term dead. He is also the author of two letters, the First Letter from Linwe and the Second Letter from Linwe. This page was last modified on 10 November 2017, at 20:27.